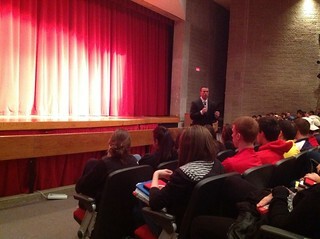 BHS students have sat through a number of assemblies over the course of their high school years, but none made an impact like today's with Chris Herren. Herren, a former high school All-American from Fall River who went on to be a star in college and eventually play for the Celtics, shared his struggles with addiction and his road to sobriety in a 75-minute talk that had students captivated. Herren, the focus of a recent ESPN Special titled Unguarded (check out a clip below), and the author of the book Basketball Junkie, got rave reviews from our students. He opened the presentation by recounting his high school experience when speakers came into his school to talk about drugs and alcohol and thinking "come on man, I don't need this." He followed by recounting his unbelievable journey from hoop star to drug addict to today where is closing in on his fourth anniversary of being sober. One of the most important messages that Chris shared was in regards to how students could help their friends who may be struggling with addiction. "The code for me growing up was not to rat on each other, but that's Hollywood. True friends step up and intervene, they don't just standby. People die when people just standby." Herren also shared an upcoming project that he is promoting called Project Purple that will encourage students to stand up against substance abuse and to also preach acceptance for students who do the right thing. He wants to help put an end to environments where students who make these choices are mocked by classmates. "It's not right that kids run their mouths because some kids are going to do the right thing." 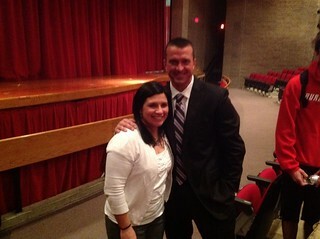 I am hopeful that the positive energy that came from today's assembly with Chris Herren will lead to some more positive movement in regards to curtailing substance and alcohol abuse while also furthering our levels of acceptance. We thank the Burlington Education Foundation (BEF) for their generous support as well as BHS Health teacher Amy Doughty for her work in bringing Chris Herren to BHS to share his story with our juniors and seniors. If anyone would like to contact Chris they can do so by e-mailing info@ahoopdream.com. You can also find out more info at his website.